Coyotes are very intelligent and resourceful animals. We’ve been slaughtering for the better part of two centuries, depending upon where it was that Western man first encountered this creature, and the coyote has responded by expanding its range, even taking up residence in major urban centers. However, I didn’t realize exactly how intelligent coyotes actually were until I came across this story in The Oklahoman from 1998. One might think that the man with the gun is getting ready to blast this coyote away, but that is not the case. This particular coyote’s name was Wylie (how creative! ), and he was born in the wild near Durham, Oklahoma in the mid to late 90’s. His mother was shot, which is usually a death sentence for any coyote pup. 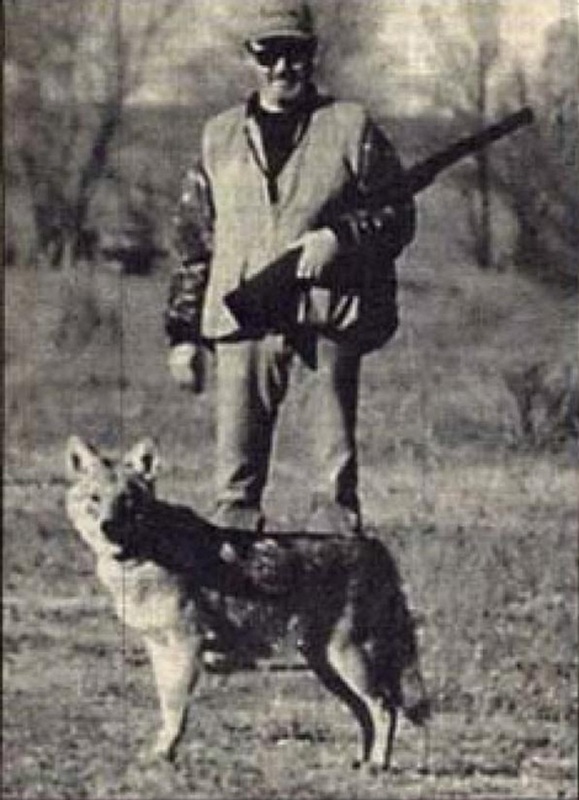 However, Max Montgomery, the man with the shotgun in the photo, took in the little coyote and raised him with his pointers, which he used to hunt quail in Western Oklahoma near the border with the Texas Panhandle. The coyote learned from his pointer family how to do the pointing thing, which is nothing more than an exaggerated stalking behavior that is refined through both training and selective breeding. If one doesn’t train a pointer to hold a steady point, it will just be a flushing dog that shows a long stalk before flushing. Coyotes are particularly good at observational learning, so it may have been that this coyote just watched the pointers being put through their paces and just followed along. All dogs, both wild and domestic, have to learn what to hunt and how to use their innate predatory motor patterns to achieve predation. Coyotes in the wild learn from their parents how to mouse and hunt rabbits and in some areas, they learn to pack up and hunt deer. This coyote’s tutors were the pointers and the quail hunter. If the other canines in the pack use an exaggerated stalking behavior to hunt birds, then it will use its stalking behavior, too. One would think that a wild animal would have a lot of fear of gun shots, but if the coyote had been introduced to the gun early on, it would have no reason to fear it. I doubt that Charlie of The Daily Coyote fame would be of much use as a bird dog. Because coyotes have been selected through heavily persecution to be nervous and reactive, I doubt that most coyotes would be able to do this sort of work, even if they had been socialized properly. For these reasons, Wylie may have been the only coyote bird dog in history. I’d like to know what happened when this guy showed up at ranch with his bird dogs. I can see someone asking about the lines of that pointer with prick ears. I guess the only answer would be that it was very old American strain. I would have liked to see Wylie in action.